UV Papertronics are paper toys with electronic circuits in them. This class pack allows for thirty students to build and design their own light up paper toy. 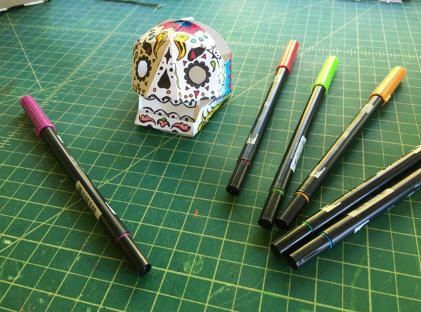 There are thirty Day of the Dead stencils that help the students design their own patterns. This kit is a great cultural project for Spanish class, science and art. Lesson teaches polarity, following directions, aesthetic design and personalization. New vocabulary is also incorporated into the project. Papercraft is a practical and evocative way to introduce STEAM concepts. Keeps little hands busy learning hands-on concepts. Engineering and design concepts are baked into papercraft projects. 2D shapes become 3D shapes. Batteries, conductive tapes and lights add technology. Papertronics are Sparkle Labs line of electronic paper toys. They are all electronic and have an LED in them once assembled. They offer a constructionist approach to learning a simple electronics lesson. They are printed with soy inks on recycled paper.